"Pat Corrigan AM is The Patrone, The Philanthropist: the collector of paintings, sculpture, books, photography and some extremely interesting side-glances." I had arranged to meet Pat Corrigan – Art Collector and Patron, especially of Aboriginal art, at the Art Gallery of NSW at 5 o'clock for a glass of wine and a chat. He was already there when I arrived (I was on time, he was early), but the Gallery was closing so we went looking elsewhere. We drove around for a bit until Pat settled on a café/bar in Woolloomooloo next to the harbor. Looking from the window where we sat was a simple open paved space with palm trees artfully planted like totems; a very dark open doorway on the building opposite faced diagonally into the area which had an odd absence of people. Long vertical shadows from the trees gave the scene a beautiful strangeness. I half expected to see Janet Laurence and Edward Hopper having a late lunch. My first question to Pat from a prepared list was, “Why Tommy Watson?” I had read in New Beginnings, the book of his Aboriginal collection, that his first experience with Aboriginal art and painters was Watson. Knowing how and why he had responded to that particular painter would be the lead in, telling me what I needed to know: What IS that first emotional HIT of desert art that can make your hair stand on end? Pat had indeed experienced that rush of recognition, the half comprehending half not, to art of mystery, strangeness and mind numbing beauty, which is sometimes how we respond to good indigenous art. Although I did not have a specific answer, his enthusiasm had said it all anyway - I was sitting opposite a man whose mind is too fast tracked to be bothered with the pedantry of a list of queries. New Beginnings is a staggering achievement, visually and intellectually. It delivers answers to Pat Corrigan’s impulse to collect, and an insight into his taste in art. What ensued over a glass of wine was a welter of conversation and laughter beyond the capability of the pen dangling limply from my hand. It showed where this man is coming from. Pat Corrigan AM is The Patrone, The Philanthropist: the collector of paintings, sculpture, books, photography and some extremely interesting side-glances. Still a dreamer at 83, still adding to his collections, still gifting works to Galleries, Universities, Libraries. Still looking for the next adventure. The role of Patron in building civilizations can never be fully estimated. Without the Patron art, architecture, literature, music could not emerge fully into the light. Money is what gives the world the art and art is the load-stone of civilized cultures. Without the Medici’s, we wouldn’t have Leonardo da Vinci or Michelangelo, without the Catholic church we would not have some of the richest art and music in history, without Guell we wouldn’t have Gaudi, to name a skimpy few. Without Janet Holmes a Court and Pat Corrigan AM, and others, we wouldn’t have great and important collections of Aboriginal Art. Enthusiastic, witty, inventive, co-operative, multi-dimensional, full of beans, warm, engaging, attractive, above all, generous. Corrigan, in truth, epitomizes what we figuratively refer to as a Renaissance Man. Australia’s Lorenzo di Medici. As a self-made man in the classic tradition, his personal history has been forged on a fierce grid. He has re-booted his life again and again, always with the energy, inspiration and acumen to do so. Looking at him talking and laughing, one can see that his secret is enjoyment – life is exciting for him. He was born in Central China to English parents. As a small child he spent four years in a Japanese prisoner of war camp in Hong Kong with his mother, during WW 2 in the Pacific. The first career on leaving school began as a junior clerk at Unilever. At eighteen he borrowed $1,000 to start his own freight company, calling it Corrigan’s Express. The genius of this at such a young age and the success that followed, rewarded him the kind of wealth he needed to follow his dream of collecting art. A passion was born. The kid who had spent ‘time’ in a Japanese prisoner of war camp, with the love of beauty and the promise to himself untouched, was already a rich man when most people are still deciding what to do with their lives. Making friends with the artists he admired, Storrier, Olsen, Whiteley, Quilty, Cossington-Smith, Gascoigne, Janet Laurence, Pro Hart, John Coburn and many more, the collection and the relationships grew. He ‘discovered’ (his word), Australian photography, buying Bill Henson, Graham McCarter, Max Dupain, Greg Weight and so many more. 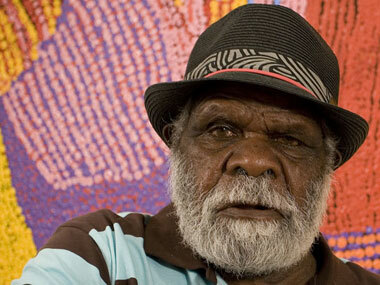 Then came another re-booting - Aboriginal Art. From walking into the AGNSW and seeing a large Aboriginal art exhibition for the first time, and spotting Tommy Watson – a whole new passion erupted, sourcing his pictures from galleries and dealers rather than journeying into the outback. He has been to Alice Springs a couple of times and is friends with art suppliers to desert communities, Chapman and Bailey based there as well as in Sydney. He knows the painting he wants the moment he sees it. He trusts his ‘eye’. The long introspection and head scratching associated with buying art is not his thing. What does take time is his research into the artist and the art-work, acquainting himself with location, historical background and other information relevant to the picture. 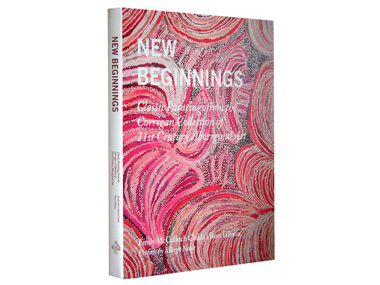 New Beginnings – Classic Paintings from the Corrigan Collection of 21st Century Aboriginal Art. Written by Emily McCulloch Childs and Ross Gibson with a Preface by Margo Neale, cover painting by Wingu Tingima. The book is a must for scholars of Aboriginal art. Page after page of paintings from the Western Desert are breathtaking. Every response to the natural world is here, deliberately captivating your eye and your senses. Ross Gibson writes of Corrigan’s clear curatorial vision, and tight focus. He chooses works only from 2000, of new and emerging artists from desert areas. These ‘emerging’ artists only began painting in their 60’s and older. Many have died since the collection began. Artists of the Corrigan collection: Tommy Watson, Bill Whiskey, Naata Nungurrayi, Patji Presley, Dorothy Napangardi, George Tjungurrayi, Markinti Napanaangka, Jimmy Donegan, Wingu Tingima, Kitty Kantilla and many others. It’s interesting that so many artists begin working in what we call their doteage. But these senior painters are already accomplished in technigue, experienced in country and tradition, when they sit down with a brush. One can only speculate at the magic of this. The answer, as always, is embodied in Aboriginal law. Elders, women or men, are sufficiently ‘ready’ to make art. For example: ochre is sacred and cannot be used without the proper authority. The artist’s subject matter must have relevance to their country, and so on. When they work, sitting on the ground in circles with their mates, they are each facing their ‘dreaming’. They are not idly gossiping, but singing and chanting their stories. Nothing is without content or context. From the gathering and eating of food, to hunting, to ceremony to healing, dancing or painting. Everything is embodied in ancestral narrative, cultural continuity, land, law and history. The essays in New Beginnings beg quoting. Ross Gibson again: “The energy and potency of ceremonial life shimmers, flicking like fire, rain, wind. The vibrating power of paint, the ancient practice enhancing spiritual power fueling creative work of every kind”. Emily McCulloch Childs writes: “As well as being maps of country they are tracts of moral philosophy suffused with natural sciences. They are not depictions of picturesque spaces. They are systems-diagrams for survival in a world close to collapse and they are surveys of enduring responsibility and fleeting opportunity. The staggering achievement which is New Beginnings, both visually and intellectually. Written by Emily McCulloch Childs and Ross Gibson with a Preface by Margo Neale, cover painting by Wingu Tingima (McCullochs, 2008). Pat Corrigan's first experience with Aboriginal art and painters was Tommy Watson, photographed here in front of one of his artworks.